For some inexplicable reason, when we saw this image of Botswana's Makgadikgadi Salt Pans, we thought that someone had finally appropriated industrially scaled salt evaporation ponds as a garden. Gigantic Suprematist geometries filled with salt-loving algae vacillating through hues of pinks, reds, yellows and oranges as the new tapis vert. Bleached, saltwind-whirled ridges as the new allée. And loyal feng shui advisers with tons of disposable money as the new superpatron for landscape design. Inexplicable, indeed. 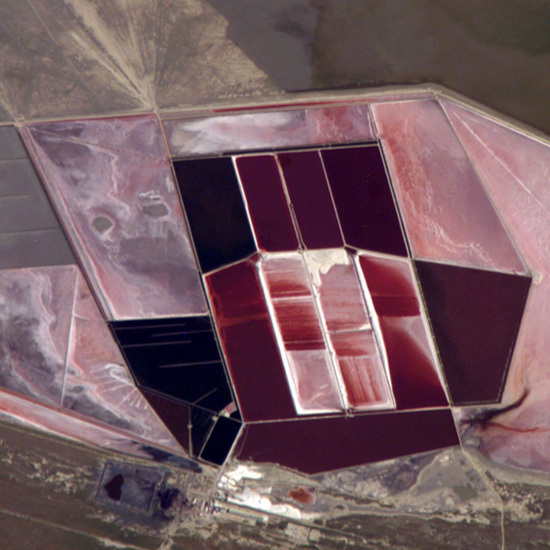 Also check out other salt ponds in the Dead Sea and San Francisco Bay. Better yet, stimulate your visual cortex into catatonic ecstasy with David Maisel's photographic series Terminal Mirage. From above, it looks like a diamond in the desert. David Maisel's work is amazing! Thanks. AR Ray: Those are the salt pans in Botswana, no? More "diamonds in the desert" of Utah.